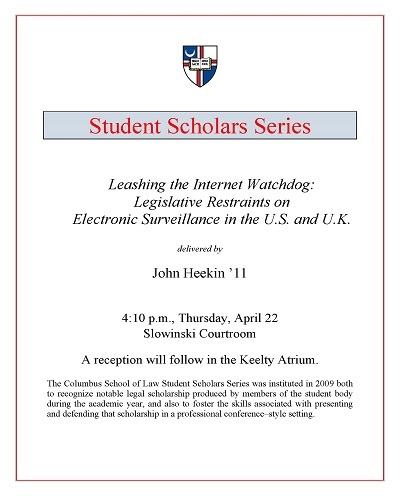 Leashing the Internet Watchdog: Legislative Restraints on Electronic Surveillance in the U.S. and U.K.
John Heekin traced the history of legislative approaches undertaken by the United States and the United Kingdom to regulate the surveillance and interception of electronic communications. Heekin, John, "Leashing the Internet Watchdog: Legislative Restraints on Electronic Surveillance in the U.S. and U.K." (2010). Student Scholar Series. 6.